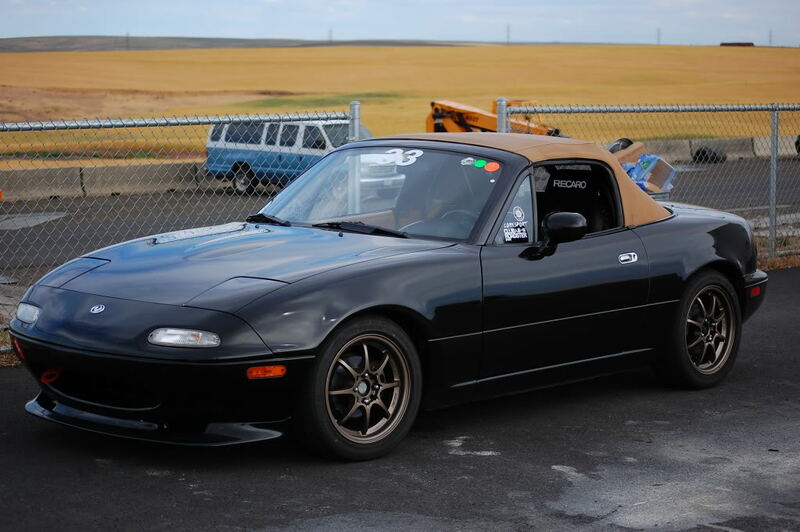 When buying Miata wheels, focus on weight, size, offsets, and compatibility. You want light wheels, since the factory wheels are light. You’ll want small wheels, for the same reasons. Offsets should be high (+35-+45mm range) so you don’t need to roll your fenders. By choosing the right sized wheels, you can avoid needing to roll your fenders. 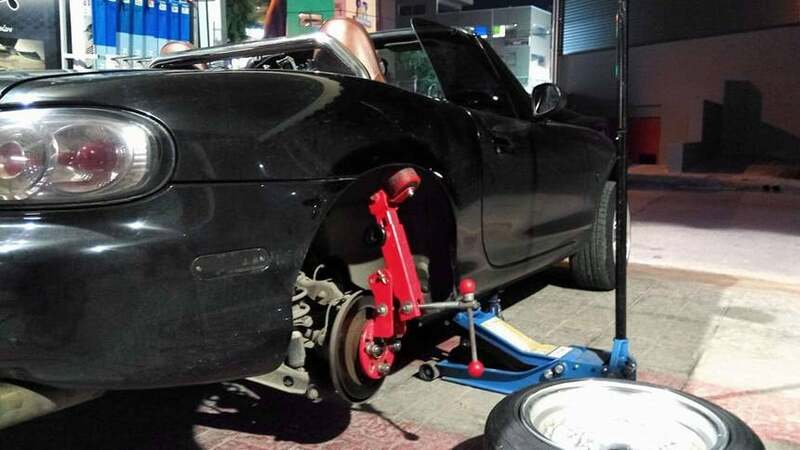 For the Mazda Miata, smaller rims are usually better. For NA and NB (1990-2005) Miatas especially, unsprung weight is a big factor. Factory OEM rims for these generation cars were in the 10-15 lbs range, and many drivers can feel a change in ride quality and performance with as small as 3 lbs of unsprung weight per corner. Where possible, we strongly recommend buying wheels that are 15 lbs or less for your NA/NB Miata. This way your car won’t feel sluggish, especially off the line. NC and ND Miatas have more sophisticated suspension, but light wheels are still ideal if you want to improve performance. The best Miata wheels for 2005+ models should be 20 lbs per wheel at the most. Luckily, there are plenty of high-performance wheels out there that fit into these ranges. One of the most important aspects of the best Miata rims is that they’re all small in size. Most first generation Miatas, from 1990 to 1997, were factory-installed with 14” wheels. 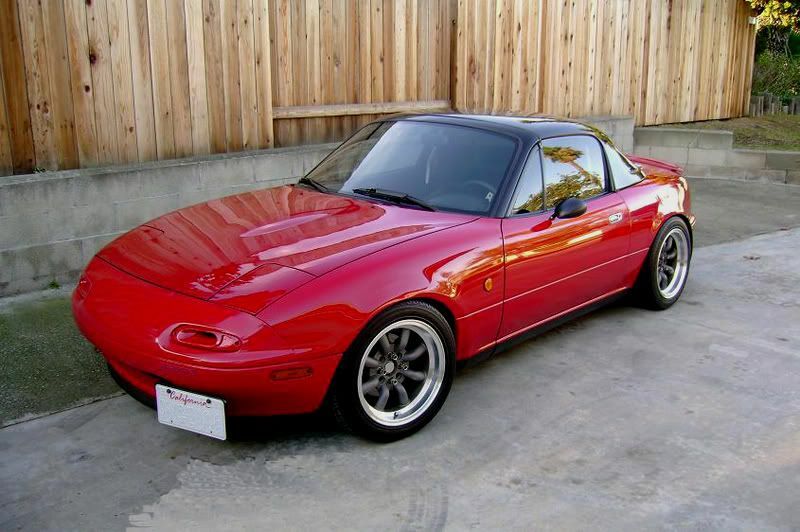 Whereas in most cases, NB Miatas from 1998 to 2005 came factory-made with 15” rims. Our recommendation for NA/NB Miatas is to use at least 15” rims, to help keep unsprung weight low, or high quality 16″ rims at most. The brakes on NC/ND Miatas are too large to use 15” rims without aggressive offsets and fender rolling, so 16” are the minimum. NC Miatas (2005-2015) increased the size of their OEM rims even more, to 17”, and they stuck with that size for ND Miatas. On a car with overfenders like this, wider wheels with a low offset are required to fill the fenders. The factory offsets for the NA and NB Miatas (1990-2005) are +45mm for 14” wheels and +40mm for the larger wheels. That being said, you generally want high offsets for your Miata, regardless of generation. Sticking to the range of +38mm to +45mm offsets will help you avoid concerns with fender lip rub. A more aggressive +35mm should be on the lower end of the offset sizes you can use, typically for wider wheels (7.5” and above). Beyond this size, you’ll have to make modifications to fit wider wheels with lower offsets. Every generation of Miata has a specific bolt pattern. This bolt pattern needs to match the wheels you are purchasing, otherwise you’ll have to return them. How bolt pattern is measured. On the left is 4 stud, which is seen on NA, NB and ND Miatas. On the right is 5 stud, which Mazda only used on the NC. So with that out of the way, let’s take a look at your wheel options based on the different generations. The best rims for Miatas made between 1990 and 2005 (NA and NB generations) are lightweight, small (15-16″), and with higher offsets of +38-45mm. Technically, these wheels fit ND Miatas because of the 4×100 bolt pattern. But the 15″-only wheels here are too small to clear the big ND brake calipers. The effective offset to make 15″ wheels clear the ND calipers will put the tires outside the fender lip, so we don’t recommend any 15″ wheel here for your later model car. Instead, check the ND wheel section below. Konig has made wheels for all types of cars, but it took some persuading from Miata enthusiasts for them to finally make a classic style wheel in a Miata offset and a 15×7” size. But they were finally made, and they look great. These are a homage to many different brands over the years, but true JDM enthusiasts liken them to Watanabe wheels. Center caps are included with this wheel, though the stock lugs fit very tightly, and you’ll need a thin wall socket (it’s better to use a narrow lug, like these spline drive lug nuts). Despite the high-quality casting method, these wheels are incredibly affordable. Also, they only weigh 13.4 lbs, which is under the 15 lbs recommended weight. Konig Helium wheels are some of the most popular and highly rated wheels on the market. Their eight-spoke design is durable and tough. Thanks to their monoblock construction, they’re very lightweight at just 11.4 lbs. Usually lightweight means expensive, but these are very affordable. You will get much better handling and response with these wheels when set up with a quality set of tires. General consensus among owners is that they might be the best budget Miata wheels around. Konig’s Dial-In wheels are made through “Flow Forming Technology”, where pressure is applied to the inner barrel of the wheel while spinning after it has been cast. It’s a similar process to the forging process, and creates a lighter, stronger wheel, with greater shock resistance. The 15×7” Dial-In wheels only weigh 10.9 lbs, while the 15×8” are 12.25 lbs, and the 15×9” are 12.7 lbs. The width you choose depends on how aggressive you want to go with your modifications, but all three of these widths are well below the suggested maximum weight for NA or NB Miatas. The 12-spoke design makes these wheels extra strong, not to mention perfect for the Miata-style. You won’t be unhappy if you purchase these lightweight, form-fitted wheels for your NA or NB MX5. 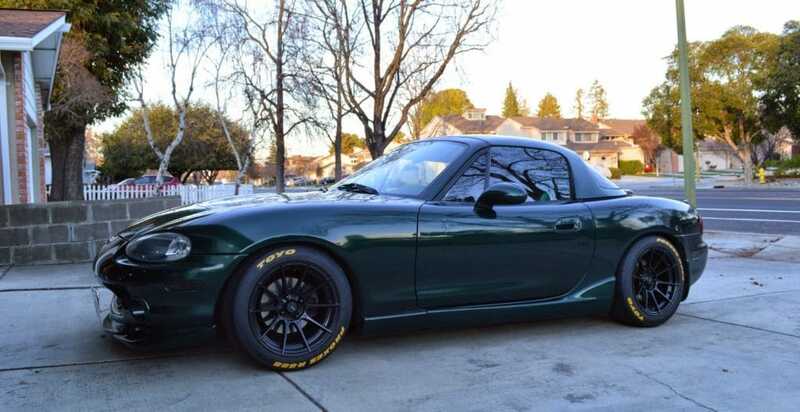 TRMotorsports’ 15×7” C1M wheels were designed specifically for the NA and NB Miata. They are lightweight (13.5 lbs) and will give your NA or NB Miata an aggressive look thanks to their double 5-spoke design, the color options, and the 30mm offset. Even with the lower offset than usual, no fender rolling is necessary on a stock suspension. They aren’t the lightest or strongest wheels on the market, but it’s hard to complain for the price. Due to how affordable they are, they are considered great wheels for the track. They can be ran with stock or aftermarket coilover suspension. Despite a slightly more aggressive offset, the wheels still don’t stick out past the lip of your fenders. Focal’s 428SB wheels are cast aluminum rims that look really slick on a black or darkly painted MX-5. The lightest weighing rim comes in at 20 lbs for 15×6.5” +38mm. They’re not that light, which can be a negative if you’re racing. This is enough to turn us off of them, but owner Miata owners love them. On the plus side, they’re very cheap and highly regarded for daily driving. 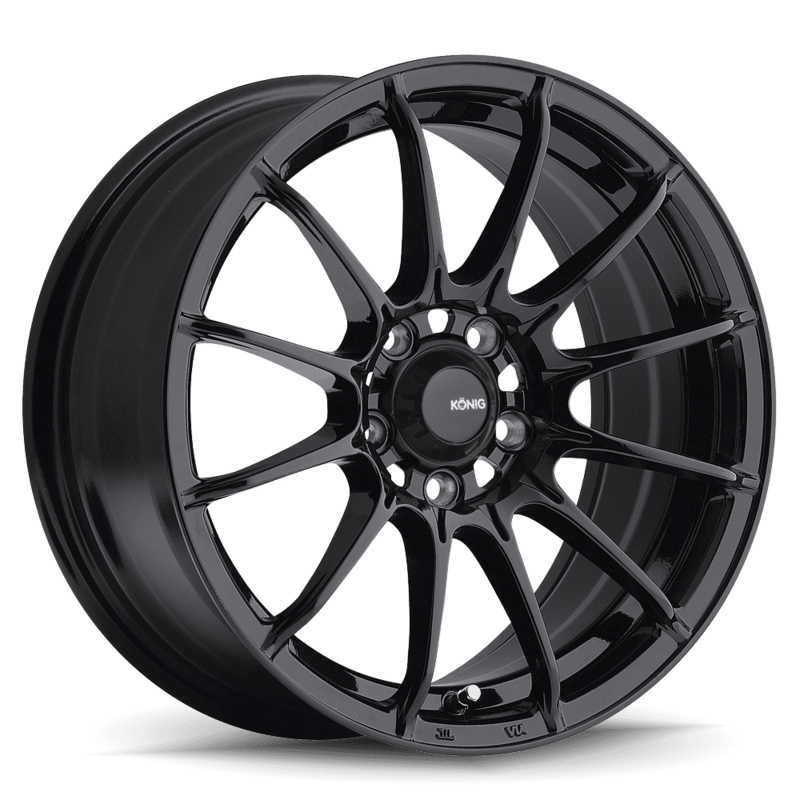 They will fit newer ND Miatas, but they only come in 17×7.5” with a +42mm offset, however. These wheels are great if you don’t want to break the bank, but want something that is nicer and slicker than factory-installed rims. Wheels on later generation Miatas were larger, with most enthusiasts choosing to go slightly larger again when upgrading their rims. The notable difference between NC and ND Miata wheels are their bolt patterns. 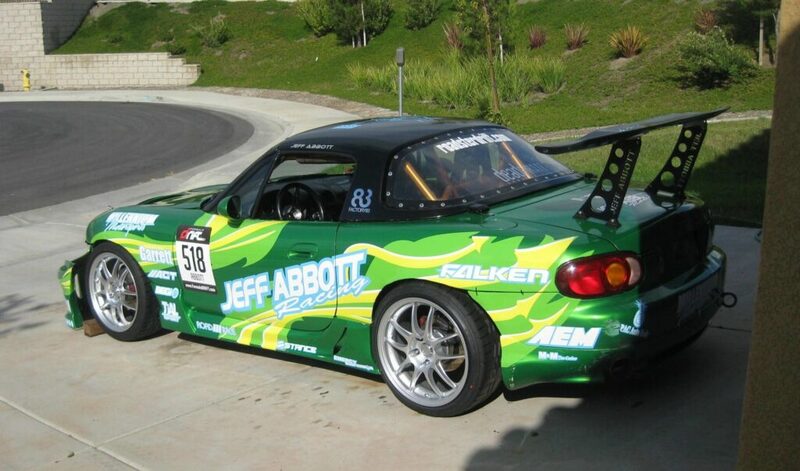 A NC MX5 has a a 5×114.3 bolt pattern or “pitch circle diameter”, while an ND uses the same 4×100 as NA and NB cars. This means the wheels in the other sections of this article simply won’t bolt onto your car, even if they are otherwise the right size. These wheels here are typically bigger (17-18″ as opposed to 15-16″) than what most people run on their early model cars. In many cases this means they are also a little heavier, but the ND can handle a slightly heavier wheel. Kuroki Racing is a renowned race team in the Japanese touring circuit, and they’ve collaborated with Buddy Club to bring the F91 to market. These race-inspired wheels are lightweight and rigid, for street driving or competition. The F91 design is six-spoke, one of the most rigid spoke formations. As 17×7.5”, they’re available for all generations of Miata. They’re a bit bigger than other racing wheels, but when combined with a quality tire, they offer much better turn-in response. Their light weight means acceleration isn’t affected. The dual valve stem allows for quick and accurate inflation or deflation while using a pressure gauge – great if you’re spending time at the track. Though these wheels can fit all Miata generations, their bigger 17″ size makes them best suited to ND or NC Miatas. Gram Lights’ 57FXX are extreme, aggressive looking wheels built in a modern concave style (where the spokes cave inward toward the center cap). Their split-spoke design is totally unique, and the spokes are placed widely apart to make the wheels stronger. The wheels are made using “RAYS Cast Flow Forming”, where the wheel’s barrel is spin-formed to ensure a stronger barrel by creating a controlled metal flow in the casting. They come in tons of sizes with 0.5-inch increments, but for the Miata we’ll be focusing on the lower sized wheels. 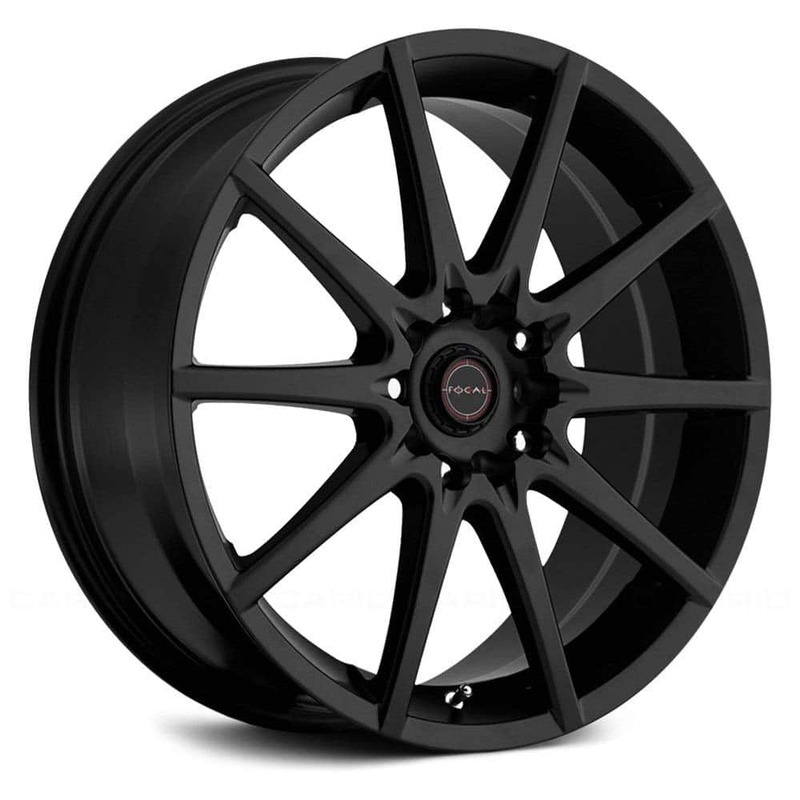 The 16×6” 4×100 wheels come in either +40 or +47mm offsets. The smallest size to fit the NC Miata 5×114.3 bolt pattern is the 17×7” with +38mm offset. These wheels are pretty pricey, but they’re some of the most stunning, best Miata wheels on the market. They’re look incredible on ND Miatas, so it’s no wonder so many owners are choosing them for track builds, show cars and for street duty. Of course, many manufacturers make their wheels in a wide range of sizes and bolt patterns. 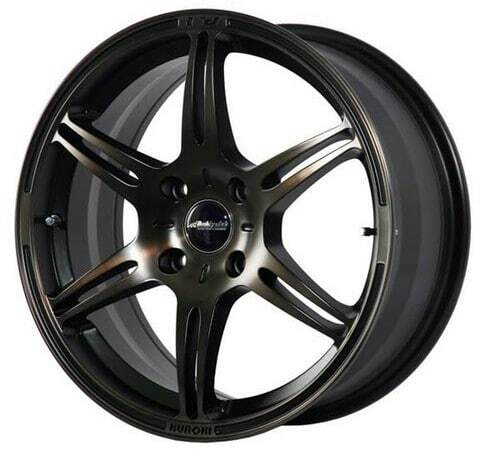 These wheels are made available in both 4×100 (NA, NB, ND) and 5×114.3 (NC) to suit all Miata models. Even the heaviest wheels are still considered lightweight, meaning the wheels below will work well on any generation. 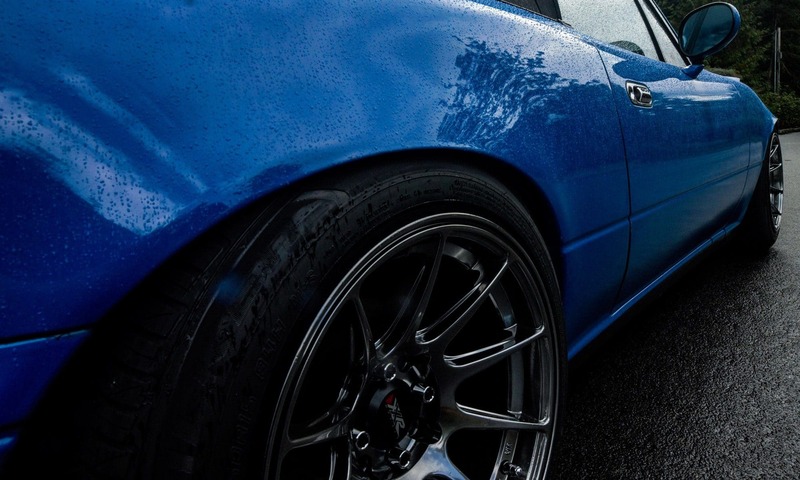 These high-performance oriented RPF1 wheels from Enkei are super lightweight yet very strong. In order to reduce the weight under a vehicle’s suspension, the M.A.T. process improves the mechanical property of the rim section by shaving the thickness and reducing the wheel weight by 10-15%. Mazda trusts Enkei to make their factory Miata wheels, so you can be sure you’re getting the highest quality here at the best price. 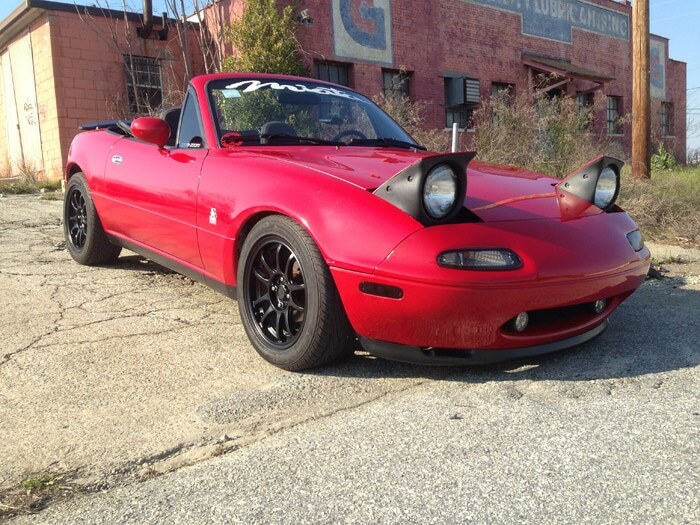 The smallest size for NC Miatas is 16×7” with a +30mm offset, and they weigh 14.3 lbs. 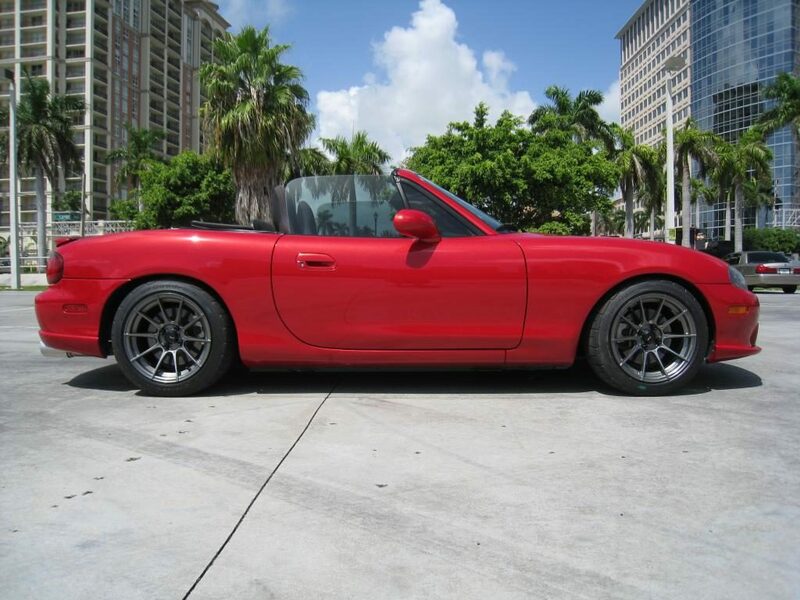 For NA Miatas, 14×7” is the smallest, with a +28mm offset and weighing only 8.4 lbs. Less aggressive offsets are available if you want to stay on the safe side and avoid tire scrubbing. These wheels are favorites for many Miata owners, thanks to a combination of great quality, great finish, strength, lightness, and price. Enkei’s PF01 wheels are extra strong and lightweight (only 12.8 lbs for the 15×8”), like the RPF1 wheels. The extra strong rolling rim production method makes the alignment on these wheels similar to products that are much more expensive. The deep sockets around the lug nuts make these rims much stronger—with less flex—than other wheels. The downside is the stock lugs won’t work and you need special, narrow extended-length lugs, such as those from Dynofit, Gorilla and Muteki. The smallest PF01 wheels for NC Miatas come in 17×7”, and weighing in at 15.9 lbs. People either love or hate the Konig Illusion wheels, because of the color finishes. If the finish is something you like, they come in a wide range of sizes and are available for all generations of Miata. For NA and NB, they come in 15×6.5” +38mm (14.4 lbs). The best size for NC Miatas are 17×7″ +40mm (18lbs). Similarly, for the ND, you’ll run the 17×7” +40mm (18 lbs) size. 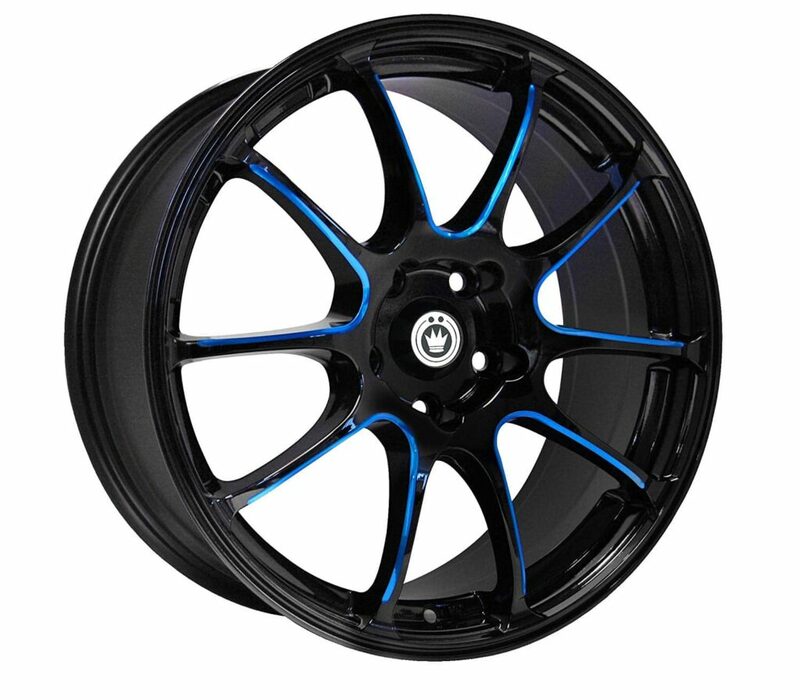 These are popular wheels for those with a dark blue or red Miata, who want to match their wheels to the body. The smallest Advanti Racing Storm S1 wheels (15×7”) only weigh 9.9 lbs, making them some of the lightest ones on the market. They also look great on any color Miata, thanks to their 10-spoke design and awesome color options. 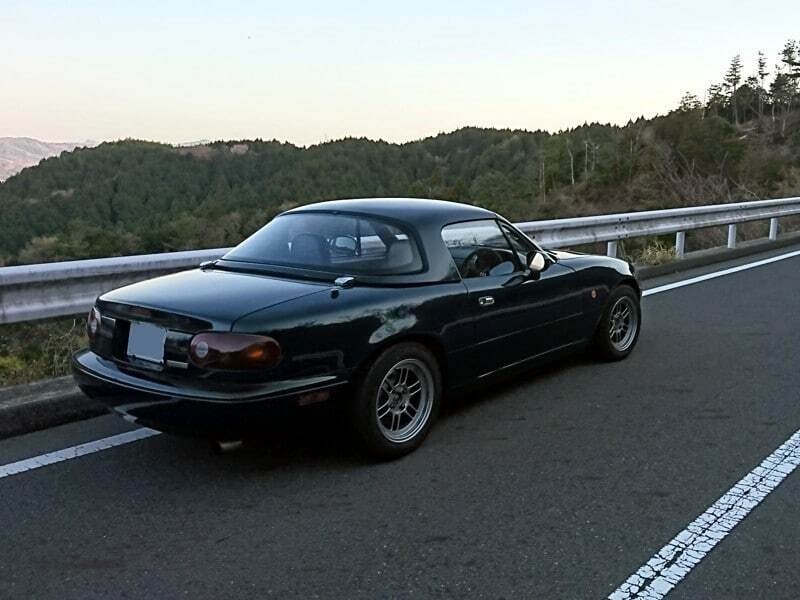 For NC Miatas, the smallest size available is 17×7”. These 9.9lbs wheels are made with the same Flow Forming technology that Konig uses on many of its wheels. Thanks to these production techniques, they’re stronger, denser, and weigh less than comparable forged wheels, at a fraction of the cost. These wheels also clear most aftermarket big brakes, and come with center caps included. The Konig Helium wheels check off all the boxes above, they’re lightweight at just 11.4 lbs, come in a +40mm offset and in 15×6.5” size. They’re some of the cheapest Miata wheels on the market, starting at under three figures. There’s a reason why you see these on so many other cars. These wheels are very lightweight, at only 12.8 lbs for smaller, NA-NB Miata wheels. Even the NC-ND wheels, at 15.9 lbs, aren’t very heavy for bigger (17×7”) wheels. They’re sturdy and strong, to withstand to stresses of autocross, and they aren’t too pricey. Obviously this is opinion based, but we love the Miata-tuner look and the Konig Dial In wheels are perfect for it. Wider and with a lower offset than some of the other rims here, these have a great concave look. A close second would be the Advanti Racing Storm S1, with a similar look. If you want to go with a classic looking wheel, check out the Konig Rewinds. These wheels have a timeless look that really suits the time in history when Mazda produced the Miata. Does another awesome Miata wheel deserve to be mentioned here? Let us know by leaving a comment below.